Jack Nicklaus, also known as "The Golden Bear", is regarded by many as the greatest professional golfer of all time. Over the course of this 25-year period of 100 major championships as a professional, Nicklaus finished either first or second 36 times, in the top three 45 times, the top five 54 times, and the top 10 67 times. 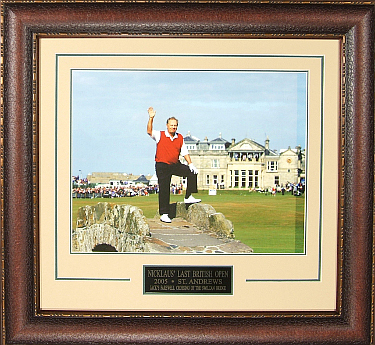 Get this Custom Framed 11X14 Farewell Photo of Jack Nicklaus from the 2000 British Open Championship with Custom V Groove Matting and Premium Leather Framing.